"Blood Must Have Blood, Part 2"
Last night marked the season finale of The 100, wrapping up what has been one of the most dramatic, suspenseful, and well-written seasons of television in recent memory. Characters were forced to make decisions that will haunt them for the rest of their lives, as everyone did what they thought they needed to in order to survive. It all culminated in a finale, where stakes were higher than they’d ever been before and there really was no perfect solution. Since the beginning of the show, Clarke and Bellamy have stepped forward as leaders of the Sky People, making the decisions that no one else wanted to make. Because of this, they feel as though they have the most blood on their hands. This season, with Bellamy off fighting to help their people escape Mount Weather, Clarke was left alone to make many of those decisions by herself and this has taken its toll on her. She will forever feel the guilt of abandoning the people at Tondc but she hasn’t had time to dwell on it, having to continue moving forward to save her people. In the finale, she had possibly the most difficult decision to make yet. With the realization that Cage would never stop trying to use her people for their bone marrow, she had to make the choice to kill hundreds of innocent Mountain Men to get her people out. This time, however, she had Bellamy right there next to her making the decision with her. She had someone to share the burden with, someone who understood how difficult it is to make these kind of decisions. But for her, it was too late. The scene between Clarke and Bellamy at the end of the episode was great on so many levels. Bellamy is the only other person from the Arc who fully understands everything Clarke has been through and knows what it’s like to have to make decisions that will hurt many so that they can live. In the end scene between them, he offers her the forgiveness that he thinks she needs to stay with the Arc because he knows what it’s like to need that forgiveness. Clarke simply cannot move past it though, no matter how willing Bellamy is to forgive and share the burden with her. She has learned that she must bear this burden so that no one else has to, but she can’t look at the Sky People anymore without feeling the guilt of what she did to get them there. For Clarke, the only option is to walk away from everything. Along with being an emotional and complex scene, this also set things up nicely for season three, especially if you’re a fan of the Clarke/Bellamy pairing. They both need this time and distance to come to terms with what they’ve done before they can ever be in anything resembling a healthy relationship. From their final scene, it’s clear that they care deeply about each other but neither are at a point that they can be together. In true finale fashion, a main character had to die last night. They’d been fighting the Mountain Men all season and there was no way that everyone could make it out alive, especially with how few of them there were compared to the enemy. Even if they had all managed to escape, there was one character who simply had no chance of survival. While it was heart-breaking to watch, it was no surprise when Maya died so that the Sky People could live. She had been helping Jasper and the rest for quite a while, not willing to sacrifice them so that her people could see the ground. When Clarke and Bellamy pulled the lever to kill those at Mount Weather who couldn’t handle the radiation, Maya was one of the innocents that had to die. Jasper and Maya’s relationship through the season has been one of the most interesting to watch develop. Without Clarke or Bellamy there to help, Jasper stepped up into a leadership position and was faced with difficult decisions himself. Maya was right there beside him the whole time, helping him through it. Because of this, their relationship was in a lot of ways accelerated, with the high stake only serving to deepen their connection. They truly did love each other by the end, making their goodbye that much more emotional. At this point, it would have been satisfying to see almost any character kill Cage. After all, everyone from the Arc has a good reason to want to see him dead. In the end though, if it wasn’t going to be Jasper, it had to be Lincoln. His journey on the show has perhaps been the most exciting to watch, as he’s developed in ways that were unimaginable when we first met him. To see him once and for all put the Grounders behind him was a big moment. His journey to becoming one of the Sky People has been gradual throughout the season and the Grounders abandoning them was the final push he needed to fully assimilate. While his love for Octavia plays a big role in his choice, I’d argue that he has also come to respect most of the Sky People, more so than his own people. Lincoln has also had to deal with the effects of a drug the Mountain Men gave him, as they attempted to turn him into a Reaper. When he was a part of the Grounders, he was a warrior but he was completely in control of what he did. As a Reaper, he was simply a murderer, unable to stop himself. He has fought to regain that control he used to have and has struggled with what he did when he was under the influence of the drug. When at long last he confronts Cage, who blows the horn that would normally turn Lincoln back into the murderer he was, Lincoln shows how strong he truly is, resisting the drug and killing Cage. This was a huge moment for Lincoln, as he was able to kill the man who made him the way he is, as well as put that part of his life behind him completely. The finale also marked the conclusion of Jaha and Murphy’s journey to the promise land, but not without complications. Jaha has become a man so set on his ultimate goal, that he is unwilling to let anything stop him, even allowing men to die so that he and Murphy can keep going. When Murphy, who admittedly has always had a questionable moral compass, is feeling more guilt about people’s deaths than Jaha, it’s necessary to question how far Jaha is really willing to go. As the former leader of his people, he has always been willing to sacrifice a few for the greater good but at this point, he doesn’t even seem affected by his decision to let people die. He’s become a completely different man, one who is far more unlikeable than he used to be. Once they reached land, Jaha went so far as to leave an injured Murphy behind so that he could get to what he believed to be the City of Light. Instead, he encounters a mansion with a holographic woman inside, who seemed to be expecting his arrival. This leaves many questions about what will happen to him and Murphy next season and opens the door for some interesting developments. In this episode, two characters made statements that accurately sum up the show. As Maya lay dying, she said to Jasper “none of us is innocent.” Likewise, when Clarke tells her mother that she tried to be the good guy, her mom responds with “maybe there are no good guys.” The point that both are trying to make is that in this fight, there isn’t a single person who could walk away without blood on their hands. Everyone has either killed someone or made a decision that has resulted in another’s death, be it by actively choosing to or standing aside and letting it happen. Because of this, no one can claim to be the ‘good guy.’ Yes, everyone had reasons for what they did, some better than others, but at the end of the day, their goal was to help their own people (which I talked about A LOT in my review of the last episode). This show is morally complex and there is no right answer to anything. All they can do is make the decisions they think are best and then deal with the consequences which is exactly what we’ll see them struggle with in the next season. "We're the good guys here. Not you." "You won't do it." "You don't know me very well." "If you need forgiveness, I'll give that to you. You're forgiven." That's it for this season of The 100, folks! Look for Laura to recap the series over summer as a part of the traditional #SummerRewatch here at Just About Write where we return to some of our favorite shows over the hiatus and write about them. 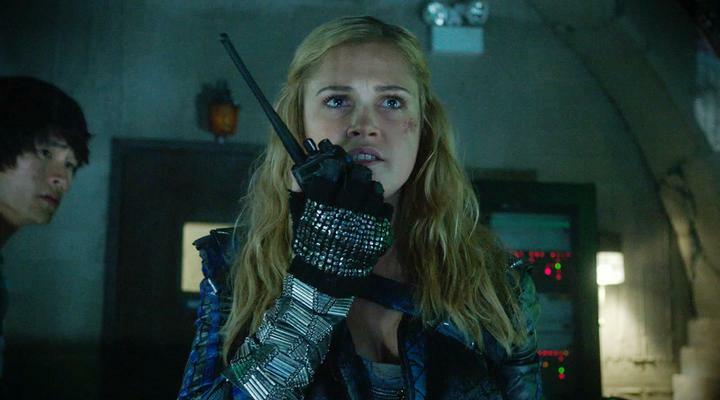 Until then, hit up the comments with your thoughts about this episode/this season of The 100! What are you hoping for in season three? Clarke has balls of steel, man. I really liked that you mentioned that moment between Clarke and her mother, it just felt like Clarke was so YOUNG for a moment - she was just a kid trying to justify herself to her mother, and it just broke my heart. Although I bet the Jaha/Murphy storyline is going to be central next season, I just thought their bits in the last two episodes were so tedious, I just wanted to get back to the action. I know they used the last few scenes to hint at season 3, but I kinda wish they left it at Lincoln being a badass or Clarke walking away, it would have been much more resonating. I also thought there might be some twist where Jasper shoots up the camp... maybe next year (I wouldn't be surprised).